For the past two seasons, Atalanta have been the surprise package of Serie A. Back-to-back top seven finishes have been earned during an exciting period for the club. Yet, this campaign has been different. With just one win from their first eight league matches, Atalanta find themselves just above the bottom three. They were also eliminated in the Europa League playoff qualifier. Let’s take a look at why it has been such a difficult start for them. Whenever a side has a disappointing start to a season, their summer transfer business is scrutinised. For the second season in succession, Atalanta struggled in the market. Whilst last year they lost Andrea Conti and Franck Kessie to AC Milan, this time around they were unable to keep hold of Mattia Caldara, Leonardo Spinazzola and Bryan Cristante. The former two headed back to Juventus, with Caldara then moving onto Milan, whilst Cristante opted for Roma. Yet, this should not have come as a shock to Atalanta. Caldara and Spinazzola were always set to return to Turin once their loan spells expired, and Cristante’s exit had appeared inevitable for many months following a breakthrough year for the youngster. Why was there no plan in place for replacing these first team regulars? When Conti and Kessie left last summer, capable alternatives were bought in the shape of Timothy Castagne and Marten de Roon who could fill the void and add depth to the squad. This season, manager Gian Piero Gasperini has simply given more game time to Jose Luis Palomino and Robin Gosens, players who were back-up options in the previous campaign. The two attacking midfielders that they have added, Mario Pasalic and Emiliano Rigoni, are still looking to find consistency with their performances. 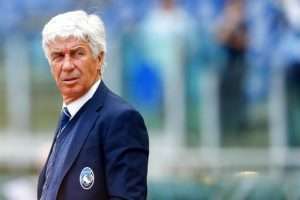 “The market has unfortunately been very sad and very small”, admitted Gasperini on the eve of the season, in reference to the lack of activity at the club. It is hard to disagree with him. When looking at the number of goals scored by the club this season, it does not seem to be an alarming statistic. Nine goals in eight games should not usually be seen as a cause for concern. Yet break that number down, and the side from Bergamo have actually failed to score in five of these eight league games. Indeed, they have not found the net at home since the opening day, when they breezed past Frosinone 4-0. As well as the players already mentioned, Atalanta loaned out Andrea Petagna and Andreas Cornelius in the off-season. In their place, they brought in Duvan Zapata from Sampdoria. The Colombian has yet to score a league goal since his summer move. Musa Barrow, the Gambian teenager often tasked with making an impact off the bench, is also yet to find the target. Atalanta amassed 57 goals in Serie A last season, an average of 1.5 per game. The fact that this number is down at 1.1 in the opening eight matches, with just two goals being scored in the last six games, illustrates the difficulties that the side are having in front of goal. With last season’s top scorer, Josip Ilicic, battling fitness issues in recent months, Atalanta’s lack of goals is a problem that threatens to persist. Alejandro Gomez, the Argentine forward affectionately known as ‘Papu’, has been a shining light since joining the club in 2014. His dribbling skills and creativity in the final third have seen him develop into a fan favourite, whilst also earning him his maiden call-up to the national side in 2017. Gasperini heaped praise on Gomez after his match-winning display against Frosinone in August, labelling him as “our Cristiano Ronaldo”. A comparison that Gomez will be proud of, yet Ronaldo has been ably supported by his teammates during his time at Manchester United, Real Madrid and now Juventus. Can the same be said for Gomez at Atalanta? Atalanta’s talisman and captain has been directly involved in five of the nine goals scored this season (three goals, two assists). Last season, the club were able to rely on Ilicic and Cristante to chip in with goals that eased the pressure off Gomez. So far this season Gasperini has not had that luxury. Gomez acknowledged back in July, “I want to play for big clubs that can play in the Champions League or fight for the Scudetto.” Now at thirty years of age, and with Atalanta enduring a tough start to the season, Papu may be considering his options over the coming months. Atalanta have started poorly before. In Gasperini’s first season in charge, back in 2016/17, the side lost four of their opening five matches. However, they then went on to win eight of their next nine games, before finishing the season in fourth place above the likes of Lazio, AC Milan and Inter Milan. A repeat of such a dramatic upturn in form looks unlikely right now, but it does indicate that with thirty league games remaining, there is still plenty of time to get back on track. The side crashed out of the Europa League in the final qualifying round, losing out to Copenhagen on penalties. Whilst this was bitterly disappointing at the time, it could turn out to be a blessing in disguise. Given Atalanta’s lack of squad depth, playing less games will allow them to concentrate on their league form instead of having to rotate the side during periods where they are playing three times a week. It may also present an opportunity to make a push for the other competition that they are still involved in, the Coppa Italia. Atalanta progressed to the semi-finals last year. Can they go a step further this time? As club play resumes following the international break, Atalanta travel to Chievo, Serie A’s bottom club, before facing Parma and Bologna in their next two fixtures. On paper, these are three winnable games that could kick-start the side’s campaign. It has not been the start that Atalanta would have hoped for when the season began in August, but given the way that they have performed since 2016, it would be unwise to write them off just yet.